(Português) Ponto de Encontro: Estação Baixa - Av. Gustavo Eiffel AVISO: As visitas não incluem bilhete para deslocação no Funicular. The original Guindais funicular was only opened for two years (between 1891 and 1893) and was closed due to an accident that entailed a ruptured cable, and the crash of the cabin’s counterweight into the pillar of the D. Luís Bridge. Fortunately no one was killed. It was in the scope of the Porto 2001 – European Capital of Culture’s urban rehabilitation plan that the decision was made to rebuilt the Guindais funicular. Inaugurated in 2004, the station and engine room of the new funicular were designed by architect Adalberto Dias using a simple language, where the transparency of the glass has the virtue of highlighting technology. 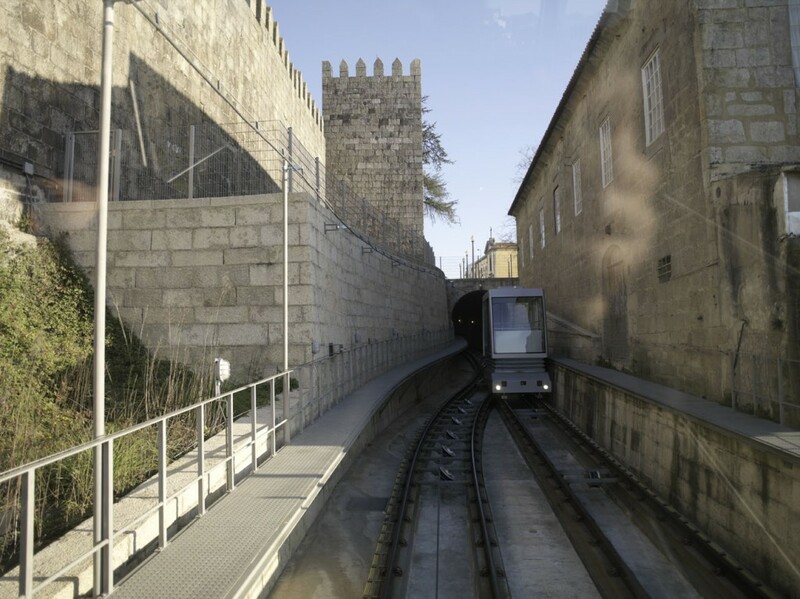 Run by the Porto underground, the Guindais funicular allows a privileged view over the D. Luís Bridge and the Muralha Fernandina [Fernandina Wall].